How does a French blogger look like in Social Media? 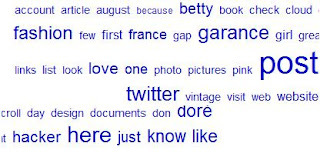 What’s great is that even if the methodology is not that straight, it gives a good overview of the tone & manners in which French bloggers are discussed in the English-speaking world: Fashion, female blogging icons like Garance Doré or Betty. Design, also present. And a little bit of hacking too.